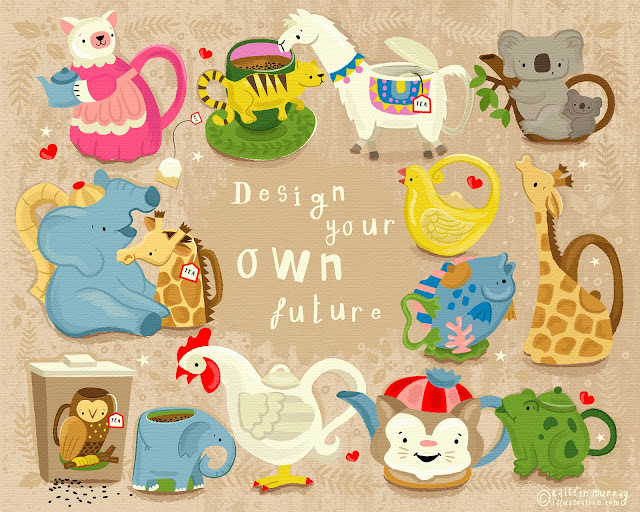 Fun, cute and quirky with colourful characters and decorative elements. My iMac. Adobe Illustrator and Photoshop. Wacom tablet. iphone. Scanner and printer. Lead pencils. Tracing paper, kneadable erasers and back up hard drives. I work digitally but I always start with pencil sketches. I like tracing paper because it’s so smooth and easy for the pencil to glide over. It allows me to collage my rough images and then re-draw over the bits that I want to change. Once the elements are scanned into the computer the process begins again. 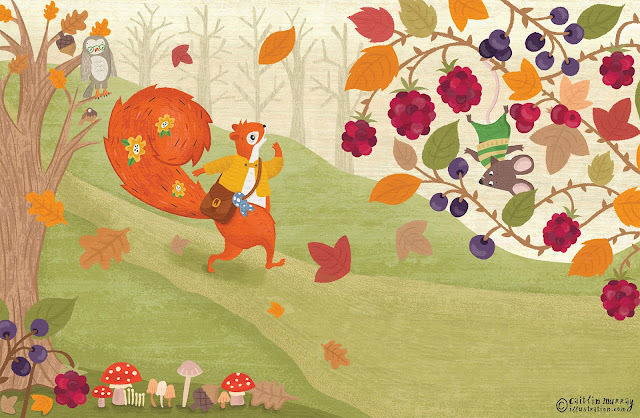 I draw over them in Illustrator and collage elements together, creating the illustration a bit like a jigsaw puzzle. I have compiled an ‘Essential Brushes’ palette which I am always adding to and sometimes I make my own brushes if I want something particular I can’t find. Mid Century Modern. Because I am so inspired by the design and colour palette of the era. It was always in me trying to get out but it was sidelined for quite some time. I had to find my way there via the scenic route - studying violin, a teaching degree in English and drama, a millinery diploma and part of a gold and silversmithing degree before finally studying illustration full time. After that I worked as a graphic artist/designer in the fashion industry, designing children’s clothes for major department stores for ten years. I finally shed it all in 2012 and re-invented myself as a freelance illustrator. I worked hard to pick up some great clients, worked on my own projects and did various online courses. Where there’s a will there’s a way! I love what I do and am so happy to have such a great balance now between my job as an illustrator/designer for Melbourne Toy Company, Tiger Tribe, my freelance work, children’s books and even my own contemporary print making practise, which I have under the name PESKY (that’s a different story though and best saved for another day) … I guess you could say that I’m a bit of a late blooming multi-tasker! I work from home and my handy husband has built a desk into the wall for me in our multi purpose dining space. It’s the lightest room of the house and we have double glass doors which look out to the garden so it’s a lovely space to work in. I am surrounded by lots of art as well as bits and pieces I have collected over the years. I am a sentimentalist and find thought and meaning in the smallest pieces. A minimalist I am not! I LOVE this stage because it’s so free and I’m not chained to the computer. Work hard on developing your own style. Never stop learning. Stay up to date with what’s out there but try not to fall into the trap of comparing yourself to others as this will only end in tears! 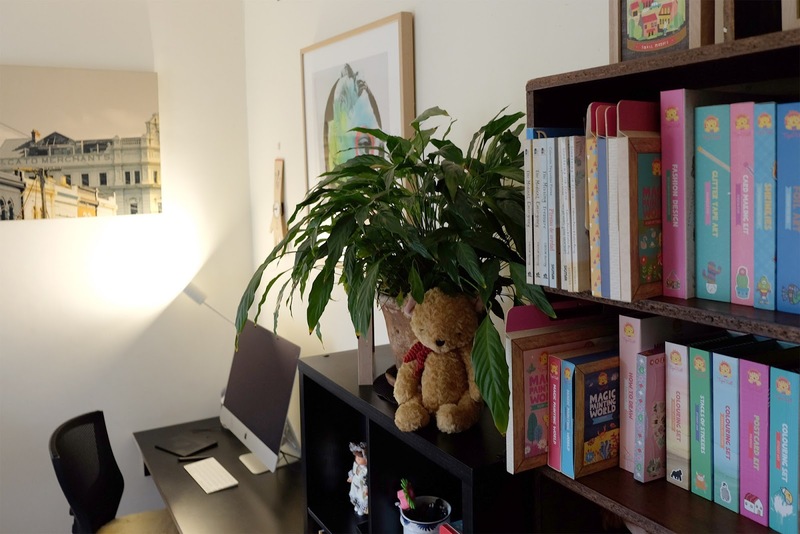 We might not all be Leonardo Da Vinci, or Oliver Jeffers (or whoever else you want to compare yourself to that makes you feel like sulking in the corner) BUT there’s enough pie for everyone and if you are doggedly determined and a hard worker then this counts for A LOT! Be nice to people and respond to emails promptly. Do what you say you will do and when you say you will do it. Be a good communicator. Everyone is time poor and nobody likes to be kept waiting. If you are good to work with people will come back to you. Oh …and if you’re in it for the big bucks you might want to think about getting another job! That said, being an illustrator is THE BEST JOB IN THE WORLD, and who really needs a Ferrari anyway? Above all, BE YOU AND HAVE FUN! I have a new book coming out in stores at the end of July! 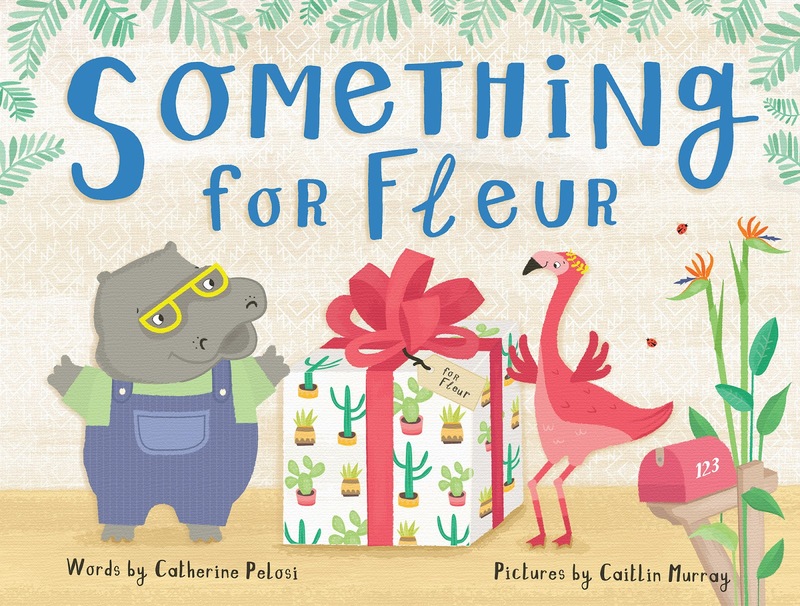 'Something for Fleur' is written by Catherine Pelosi and illustrated be Caitlin Murray. Published by Lothian, it launches in Sydney at The Children’s Bookshop, 6 Hannah St. Beecroft on Saturday 4 August at 4pm and in Melbourne at The Little Bookroom, 759 Nicholson St, Carlton North on Sunday 12 August at 3pm. Available for pre-order. 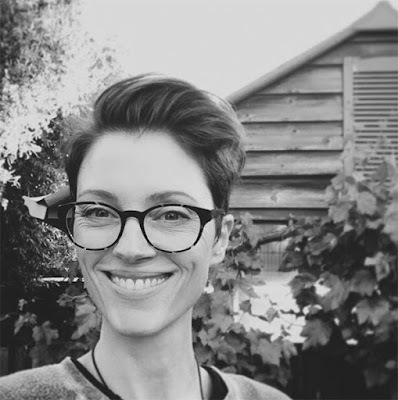 Caitlin is a Melbourne illustrator/designer with over 15 years experience in transforming concept ideas into actual 3D products. Her work can be found on children's products, picture books, toys, stationary, clothing and much more. 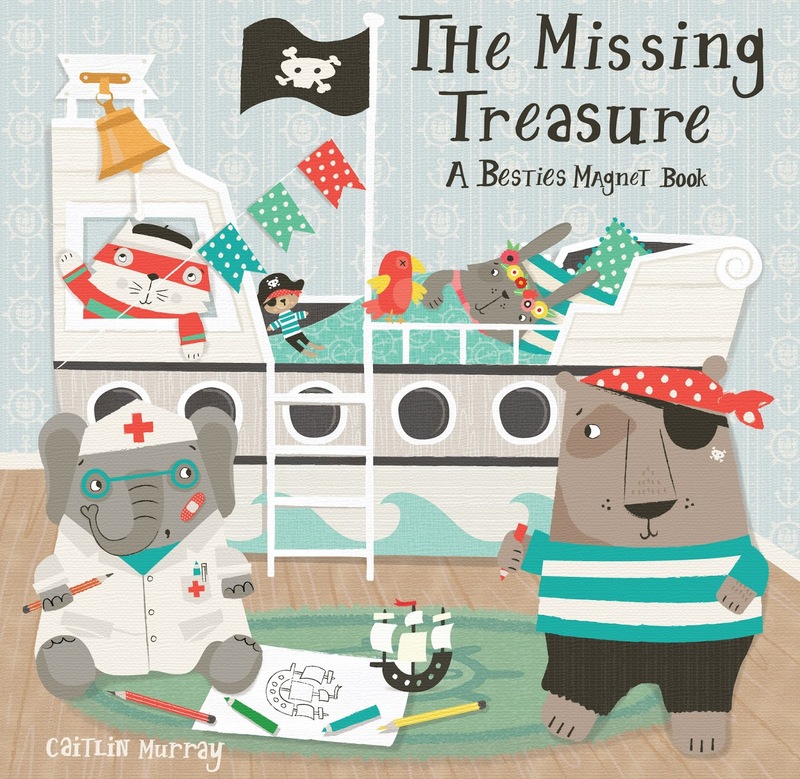 When she’s not designing for Melbourne toy company Tiger Tribe Caitlin works as a children’s book illustrator from my her home studio in Melbourne’s North - where she lives with her husband, her cat and her many art projects. You can find out more about Caitlin on facebook, instagram, twitter and by checking out her website.